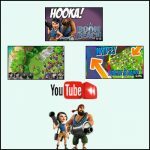 War Factory 45 | Boom Beach. All about the Game! 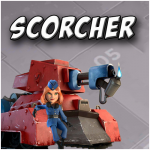 ← The “heroical” update: opinion. Poll. War Factory 45 (or Colonel Gearheart War Factory 45) is an island on the archipelago that can be found after upgrading of radar to the level 15. 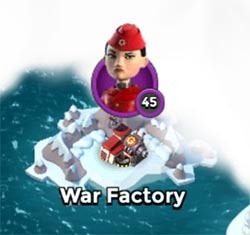 This island is very important because it unlocks 2 very important things: War Factory event (every Thursday) and the second hero – Cpt. Everspark. But to open the hero and the event we need destory this 45 lvl Factory first. Moreover, we must to do it only by one successful attack… In this post, I’ll describe how to do it. At first glance, the defense doesn’t seem very strong because there are only 10 defensive buildings (including two protos) that covers left side of base and can cause damage if to attack from there. However, not everything is so simple…Firstly, the prototype defenses have big stock of health and to destroy at least one of them directly from the Gunboat requires a huge amount of energy. Secondly, a big quantity of boxes will distract attention of attacking units and cover enemy defensive buildings allowing them to their work. Therefore, the best way is to attack directly the HQ not taking into account other buildings. Best suited for this are Zookas. In the picture below, I’ve marked the main places which are important for attack. Now, let me describe what mean all these notes and how to attack step by step. 1. 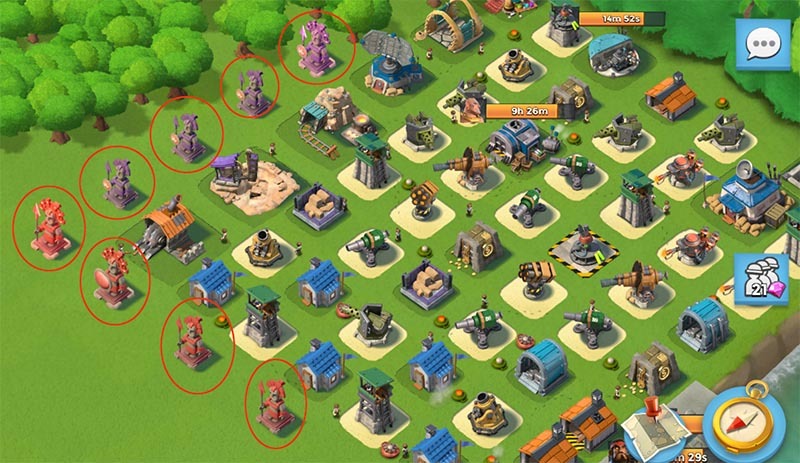 Destroy 2 Sniper Towers marked with number “1” with the help of Barrage or Artillery. If not to destroy them – they will be attack your troops during landing and grouping. 2. Land your Zookas in the landing area that is marked with blue bar and number “5” and lead all of them using flare and smoke screens directly to the attack zone (green spot and number “4”). The best route is marked with blue dotted line. 3. 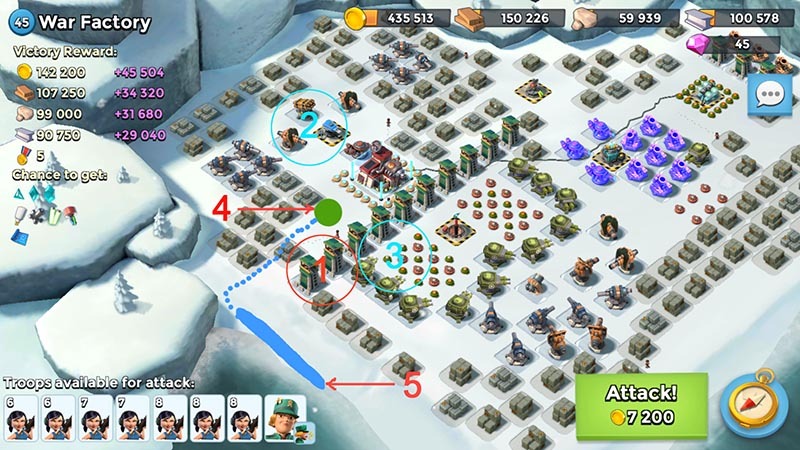 With the help of Shock Bombs switch off all defensive buildings which are marked by numbers “2” and “3” and let your troops to destroy the base. That’s all. 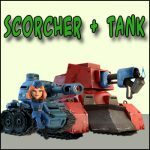 Hope this post will help you to defeat the insidious Colonel Gearheart 45 and unlock Captain Everspark. This entry was posted in ATTACK, OTHER and tagged Attack. Bookmark the permalink. This worked perfectly! 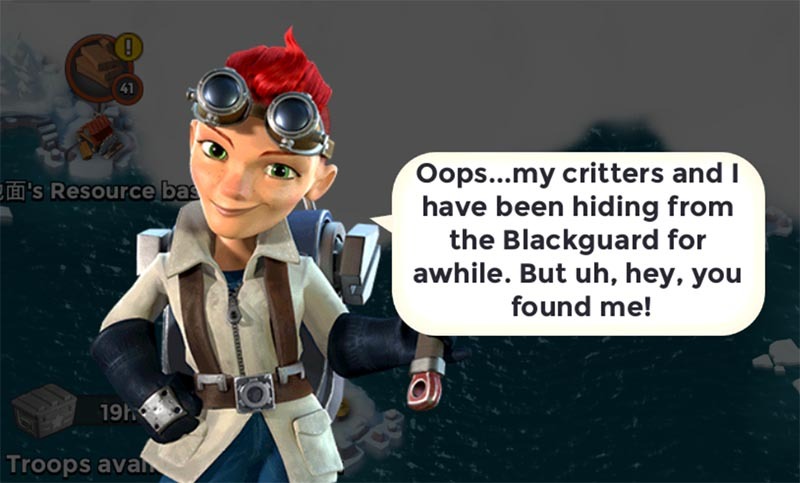 I’m not a big Zooka fan, she dies to easily for my taste. But I used L16 Z and I would suggest taking Dr. Kavan with you and using his shield as you hit the beach, thus giving you a chance to hit the flare on HQ and lead the Z through the smoke screens. And remember the SB’s, if you don’t succeed at first maybe power powder up your gunboat statue to give you more S/bomb protection. Good luck.